The tire pressure warning valve and transmitters constantly send radio waves to the tire pressure warning antenna and receiver. Under the conditions below, the tire pressure warning antenna and receiver is unable to receive the signals from the tire pressure warning valve and transmitters, and a DTC is stored. Facilities or devices that use similar radio frequencies are located in the vicinity of the vehicle. The tire pressure warning valve and transmitter ID is mistyped during registration. A wheel from a different vehicle is installed. When a transmitter ID is not received from a tire pressure warning valve and transmitter for a total of 20 minutes while the vehicle speed is over 8 km/h (5 mph) or no transmitter ID is received from all of the tire pressure warning valve and transmitters for a total of 20 minutes, DTCs are set. DTCs from C2121/21 to C2124/24 can only be cleared by using the Techstream. DTCs from C2181/81 to C2184/84 can be cleared when the transmitter in the tire pressure warning valve and transmitter sends a forced transmission signal or signal check mode (test mode) ends. 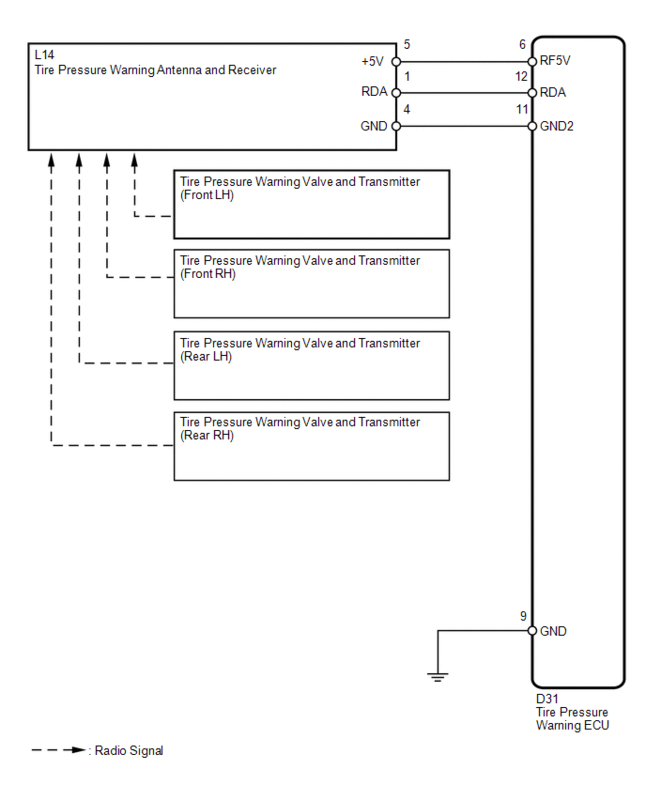 DTCs from C2181/81 to C2184/84 are output only in signal check (test mode). Tire pressure warning valve and transmitter is not in stop mode. Any transmitter ID is not received from tire pressure warning valve and transmitters. For 20 minutes or more, vehicle speed is more than 8 km/h (5 mph) or no vehicle speed signal or engine speed signal is received. No transmitter ID is received from tire pressure warning valve and transmitters for 20 minutes or more. Test mode procedure is performed. 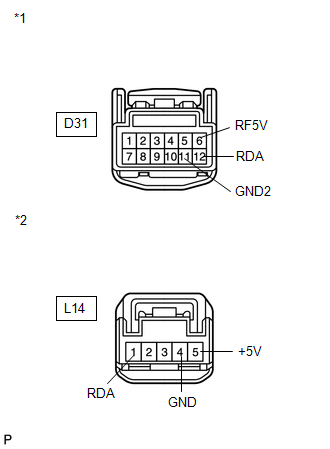 When DTCs C2121/21 to C2124/24 are set, DTC C2173/73 may be set simultaneously. In such cases, troubleshoot C2173/73 first, then troubleshoot DTCs C2121/21 to C2124/24. (e) Enter the following menus: Chassis / Tire Pressure Monitor / Trouble Codes. When DTC C2173/73 is output, troubleshoot that DTC first. Then troubleshoot DTCs C2121/21 to C2124/24. (1) Facilities or devices that use similar radio frequencies are located in the vicinity of the vehicle. If the vehicle is located in an area described above, the tire pressure warning light may come on only in a particular area due to interfering radio frequencies. (2) Devices using similar radio frequencies are used in the vehicle. Facilities, or devices that use similar radio frequencies are not located in the vicinity of the vehicle. Radio transmissions may be interrupted due to the surroundings or devices installed by the user. (g) Check the values by referring to the table below. (h) Rapidly reduce the tire pressure for each wheel at least 40 kPa (0.4 kg/cm2, 5.8 psi) within 30 seconds. If the "ID Tire Inflation Pressure" data has not changed, reset the tire pressure to the appropriate specified value and rotate the tire 90 to 270 degrees. Then, rapidly release the tire pressure and recheck it. Record the transmitter ID of which "ID Tire Inflation Pressure" data corresponds to each tire. (j) After confirming that the "ID Tire Inflation Pressure" data for one tire (ID1 to ID4) has changed, repeat this procedure for each wheel. Identify which transmitter is not being received. (a) Disconnect the D31 ECU connector. (b) Disconnect the L14 receiver connector. *: Displayed only when the ID No. is not registered. (g) Check the ID number on the identified transmitter by removing it from the tire and wheel. (h) Confirm that the ID number on the transmitter and recorded transmitter ID match. (a) Replace the tire pressure warning valve and transmitter (See page ). (a) Perform registration (See page ). (a) Replace the tire pressure warning antenna and receiver (See page ).